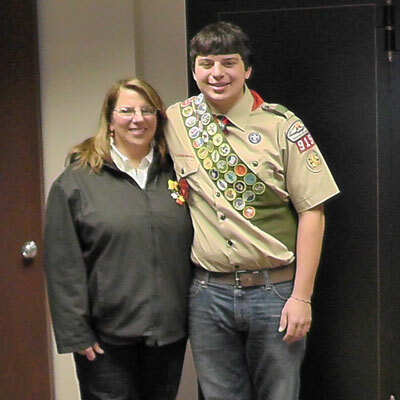 Angel and Dillon after he received the rank of Eagle Scout on October 31, 2013. Dillon was born on Nov. 18, 1995. He was the youngest of 3 boys being raised on the family dairy farm in rural Wisconsin. He loved anything with wheels and had 2 speeds…fast and stop. He started riding a 4-wheeler at the age of 3 and started racing a dirt bike competitively at the age of 6. He has acquired 216 trophies from his racing career. He was in scouting all his life and achieved the rank of Eagle Scout. This is the highest rank you can get in the Boy Scouts of America. He was a 2014 high school graduate. He loved to help people and was helping his best friend with yard work when he got stung. His best friend did CPR until help arrived and they did everything they could. Dillon was in a coma and was NEVER going to wake up. We had second opinions to verify this fact and was told we had to consider the “quality of life”. He wouldn’t have wanted it like this. We honored our son’s wishes to be an organ donor and made the decision to end life support. No parent should ever have to go through something like this. This was our “baby”. We made a decision right there in the I.C.U. of the hospital to make sure NO PARENT ever had to go through this. On Oct. 4th, 2014 he became our Angel. We are going to do our best, while grieving, to make positive changes. Here are some of the cool things he did in his short life of 18 years………………………. He worked on the farm his whole life. He picked rocks when he was 3 and fed cows as soon as he could recognize the numbers 1,2,3. This was the number of scoops to feed each cow their protein. He worked and paid for ALL his dirt bikes and repairs, 5 Suzuki RM’s: a 65cc, 85cc, 125cc, & (2) 250 cc…1 four stroke and 1 two stroke. He also loved snowmobiles. He started on an Arctic Cat Kitty Kat at the age of 3. He bought a Polaris Dragon RMK 700 and raced it in his first snocross race Feb. 2014. He was smart in that he saved his money for bikes and snowmobiles, but drove 1990’s Ford Festivas. He had 3 total and one of them he turned into a “field beater” after the repair shop said it wasn’t road worthy. HA! He put on 1000 miles on that car beating the crap out of it. We had a motocross track built in our cowyard and Dillon took that field beater and ran it around the track going over the whoops missing the double jumps and “drifting” around the corners. He was a “stuntman” in the making. Being the youngest of 3 boys he knew all the tricks and even added his own special touches to the shenanigans. We loved having all the friends over to do crazy, silly, boy stuff but in a “supervised” manner. We were like the “kool-aid” parents. Kids came here to do goofy fun things in a somewhat “safe” manner. With a sawmill and a big shop the kids could build and fix anything anytime. Grandpa owns a “recycling center” so they could make new bikes from old & 3 wheeled bikes from 2 wheeled bikes and the list goes on & on. Dad was a good welder and soon the boys could “fabricate” what ever their hearts desired….just as long as the chores were finished. The Saturday before Dillon got stung he was on the tippy tippy top of our barn roof helping the painter hold his spray hose. The barn roof painter said he would pay Dillon $100/hr and Dillon said Heck Ya!! Easiest money ever made! Holding the the sprayer hose, on the top of the barn roof, NO SAFETY GEAR!! (don’t worry, the over spray makes everything very sticky.) Point I am trying to make is that he was very active and adventurous and it was a tiny bee that took his life. Dillon was going to do great things in this world and he was going to change it for the better. How do I know this? He loved to help people. He would go out of his way to make someone feel special or get them to smile or laugh. He had a huge heart and didn’t care about appearances. If you needed help “NOW” he was there with barn clothes on and cow poop falling off his work boots. He was a designated driver for all the older friends and relatives that drank and even would go out on a school night. When I scolded him for this he reassured me or “convinced” me that a lack of sleep on a school night was better than someone getting hurt or killed by a drunk driver. I really miss all the antics and entertaining he did here on the farm. He would do anything to get a”rise” out of me and then to top it off he’d ask me to videotape it or take a picture. Brings a smile to my face just thinking about it. Dillon riding a wheelie on his dirtbike in his tuxedo before prom 2014. Along with racing, scouts and farming, Dillon was in the F.F.A. since middle school and was on the officer team all through High School. He loved bringing a calf to school for a fund raiser and one of the teachers had to kiss it because that teacher got the most votes! He was great with animals! This doesn’t mean he loved his chores. Just like any other kid or grownup for that matter, he would rather help anyone else than get his own work done. But being on the farm, you don’t have a choice. Do your work, then help others. Dillon also had a beautiful girlfriend. They had just celebrated their 18 month anniversary the week before. He bought her carnations and they watched the movie,”A Fault in Our Stars”. Ironic, isn’t it….one of the characters boyfriend dies in the movie. 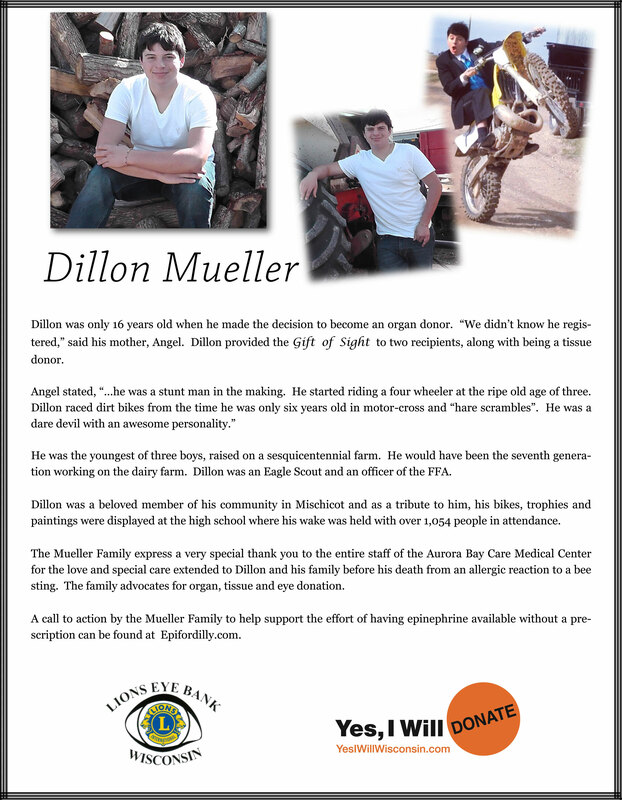 Dillon was in a coma for a week after he got stung. 40-50 students came to visit him every single night. Parents, teachers, counselors, coaches and even the principal and administrator came to visit him. I had no idea what an impact our son had on our little community. We had to have his wake in the high school gymnasium in order to accommodate all the people. 1,054 signatures were in his book at the wake and not everyone signed it. We had the meal at the same time in the cafeteria. We were allowed to bring in Dillons 2 dirt bikes and trophies and paintings into the gym. What a great tribute! The next day after a private family service, the village closed off the streets and allowed us to have a dirtbike procession from the church to the cemetary…what a way to honor our son. This is a poster created by the Lions Club. Click on the image to see a larger version. Dillon was an organ donor. He had signed up online shortly after his 16th birthday. What a relief this was to me because he hadn’t signed his drivers license, something I had been nagging him about. The online donor registry was my Godsend. I was so upset that my son was going to die and not be able to donate his organs, but because he had signed up online, he was. He has given the gift of sight to 2 people in our state. One of them contacted us over the holidays. This too brought us comfort. Bone and tissue can be stored for up to 5 years and help up to 50 people. Please register online today to make sure you can be a donor as well. Our 6 yr old daughter is allergic to eggs and peanuts. We have a high deductible on our insurance plan. When I went to have her epipen rx refilled so she could have one at school I was shocked! Even with a $100 voucher from the company, we had an almost $200 copay. Many families can’t afford that. Please add me to your email list so I can somehow help with your efforts to get epipens in schools. My oldest daughter, Ashley Tess knew Dillion and graduated from Roncalli 2014. Our family is so sorry for your loss. We hope to help keep Dillion’s loving snd giving spirit alive! My email is brothersracing@live.com. Check out this cool you tube video: AB Dillon Celebration Video 2014 Thanks for your interest! We may not be able to “do it all” or “do it everywhere” but we will “DO IT FOR DILLON”!! Check into President Obamas Epi-Pen availability act for more info. as far as schools are concerned. I am not knowledgeable enough to give facts on this part. This all is very new to me, so please understand. Thank you for your condolences. What an amazing young man. Check out this cool you tube video done by Aric Bostick the nationally known motivational speaker. AB Dillon Celebration Video 2014 Its a great tribute to Dillon. I don’t know what you have for medication information, but this is do-able. Epi is cheap, a few dollars per dose. The pen/auto injector is the expensive part at over $90 each. I’d be honored to help you work on this. Thanks for your support. By spreading the word and telling folks about our online petition at change.org you will be of great assistance. Thanks Again! Please encourage folks to sign our petition. Thanks! Wow-What an incredible story and YES, I agree- Epi-Pens should be available over the counter and every person should have one to help themselves or someone else in need and every public place should have one as well. I don’t know where you go, but start an on-line petition. May God Bless you and your family. I am so sorry to hear of your son’s passing. I lost my daughter 8 years ago to a crosswalk accident, so I know the pain. Epi pens should be available without a prescription as far as I am concerned. Had there been one on hand your boy would still be here. I will gladly sign your petition. Does the loss of a child ever get easier? I guess not so much easier as more “bearable”……just trying to cope and get used to the “different normal”…..it is not a “new normal” because new means clean and shiny and pristine. This is just a “different normal”. I pray to God everyday to help me in whatever HE has in store for me. Thank you everyone for all your comments of love and support, they really keep me motivated. I didn’t know Dillon, but I can see from your story that our world lost a wonderful young man. I, too, know the heartbreak of losing a son to a fatal reaction. It is a long and beyond-difficult road, but I hope that you are able to find some comfort in the help that you are providing for others. May Dillon’s memory stay alive in all that read your story. I am incredibly sorry for your loss. As a parent of children with life threatening allergies, it is my greatest fear. However, I have mixed feelings about the petition. I think it would be wonderful for all first aid kits to come with epipens which make them more likely to be in all homes. However, to just make it an OTC medication I do not think would solve the problem. As I think it would be unlikely that everyday people who have no concerns of known allergies would purchase it. It would just be like all the other medications in the pharmacy I ignore because I don’t have a specific use for them. The other concern is price. I just purchased AuviQ and it was $400. With a high deductible this was not covered. We really need another set, but cost is a huge factor. Prices would have to be drastically diminished to make it an affordable OTC med. Also, on your endeavor I hope that you would advocate for AuviQ vs the standard Epipen as they are much easier to use. I am also concerned that it would diminish the publics precpetion of how serious life threatening allergies are. Food allergies parents, particularly nut allergies, have to fight daily to keep our children safe. I see stories all the time of people saying, “oh it’s okay for them to eat this. If they react you have an Epipen” This is hugely false. Epipens do not always save lives. There have been many instances where it hasn’t. They do however help delay/diminish the reaction until help arrives. I don’t want to ever see my children in a situation where someone feeds them their allergen thinking “if something happens you can just get an epipen at Walgreens.” Because that isn’t the case. Delay of administering, even by a minute can have drastic outcomes.